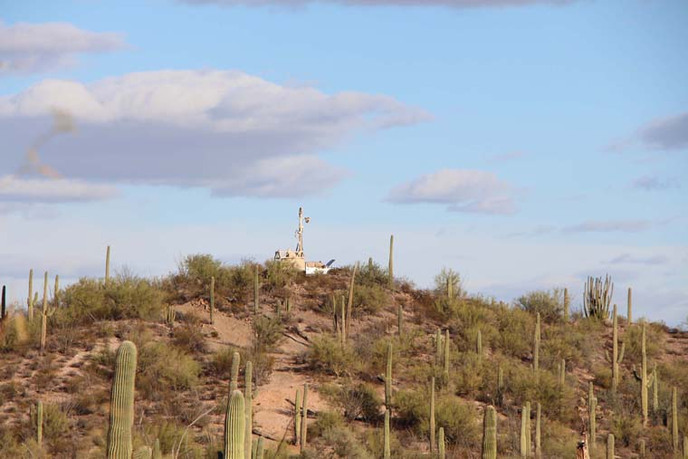 US Customs and Border Protection mobile surveillance tower in Organ Pipe Cactus National Monument, 2017, Arizona. Photo: by Nina Valerie Kolowratnik. 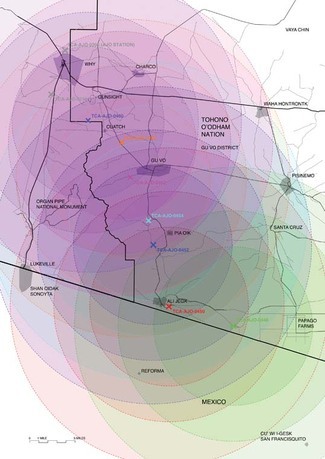 In April 2017, United States Customs and Border Protection published an Environmental Assessment stating that 16 Integrated Fixed Surveillance Towers will have no considerable impact on the Tohono O'odham Indigenous Nation, where they are proposed to be built. 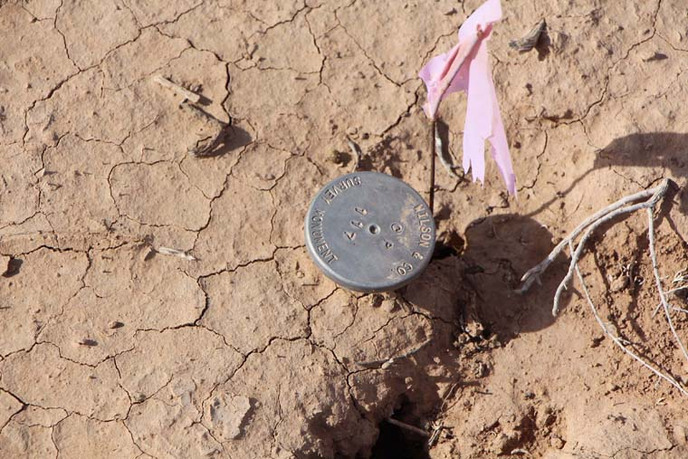 For tribal members, however, the towers' presence will disrupt spiritual practices and daily life, and irreversibly destroy a landscape they hold as sacred. 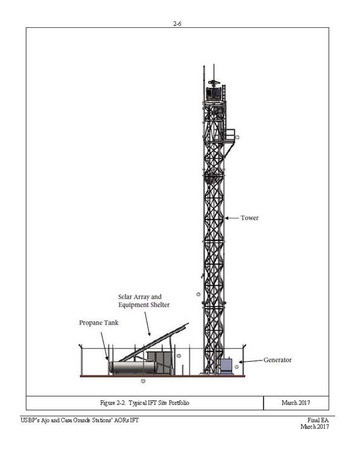 Assessing Surveillance produces, in collaboration with Tohono O'Odham tribal members, a Counter-Environmental Assessment that documents and describes the actual impact these towers, and the border militarization they bring with them, will have on Tohono O'Odham culture and daily life. 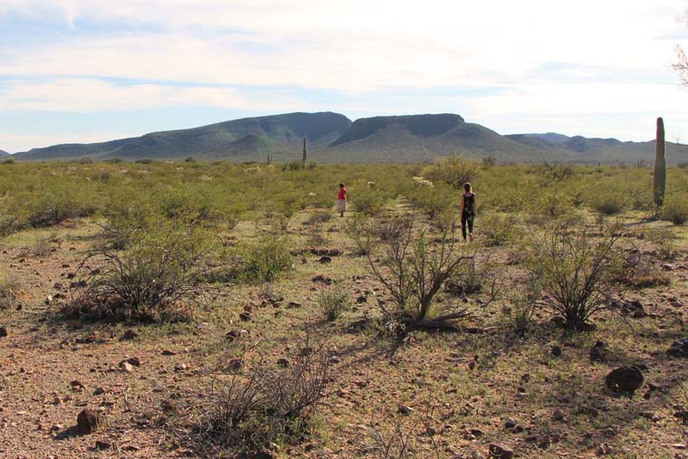 Through mapping, spatial analysis, interviews, and oral histories, this research project brings indigenous voices into the framework of environmental review, thereby challenging the ways Environmental Assessments and Impact Statements understand terms like landscape and its relationship to people, land use, material and immaterial culture, sovereignty, and environment itself. Caitlin Blanchfield is a writer and a historian. She is a PhD candidate in architecture and comparative literature and society at Columbia University and a contributing editor to the Avery Review. Her work investigates issues of territoriality, infrastructure, and human rights in the making of the Americas, as well as the rhetorics of historical narratives. Her writing has appeared in the Avery Review, Artforum, New Geographies, Log, and elsewhere. She edited the publications Columbia in Manhattanville, with Nora Akawi; and Amale Andraos’ The Arab City: Architecture and Representation; and with the Avery Review, And Now: Architecture Against a Developer Presidency and Climates: Architecture and the Planetary Imaginary. Her work has been shown in the Oslo Architecture Triennale, the Venice Architecture Biennale, Akademie Schloss Solitude, and elsewhere. She holds a MS in Critical, Curatorial and Conceptual Practices in Architecture from Columbia University and a BA in History from Oberlin College. Nina Valerie Kolowratnik is an architect and researcher currently based in Vienna. Her practice is situated in the context of forced migration and claims to land and property, and develops spatial notational systems that operate within human rights debates. Since 2014 she has been teaching graduate courses on borderlands, migration and counter narratives at Columbia University Graduate School of Architecture, Planning and Preservation (GSAPP) and TU Vienna. Kolowratnik’s book The Language of Secret Proof, a research project on evidence-production within Native American land claims, is forthcoming from Sternberg Press. She has co-edited Promiscuous Encounters (GSAPP Books, 2014) and Fluchtraum Österreich (Asylkoordination, 2015). Recently her work has been shown at Stacion CCA Prishtina, the Venice Architecture Biennale, and the Oslo Architecture Triennale. She is the recipient of the Outstanding Artist Award in Experimental Tendencies in Architecture 2016. Kolowratnik holds an MArch from TU Graz and a MS in Critical, Curatorial and Conceptual Practices in Architecture from Columbia University.